UTI-Stat Liquid Cleansing from HealthyKin.com is a natural urinary tract cleansing complex containing a proprietary blend of concentrated Cranberry Proanthocyanidins, Ascorbic Acid, D-Mannose, FOS and Bromelain - to inhibit adhesion of infection causing E-coli bacteria to urinary tract walls, increase urinary acidity to create a less tolerable environment for E. Coli, and stimulate the growth of probiotic bacteria in the small and large intestines. UTI-Stat has been shown effective in reducing symptomatic UTIs, including urgency and frequency of urination, when used in conjunction with hydration and a hygiene program. UTI-Stat helps to support urinary tract health and prevent recurrence of infection. 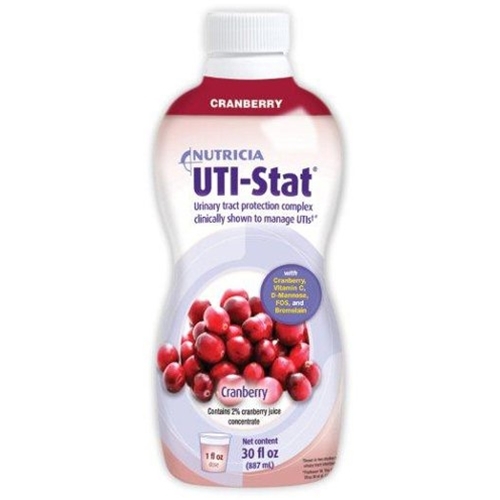 Each one ounce (30 ml) serving of UTI-Stat provides as much cranberry proanthocyanidins as approximately five 450mg cranberry tablets (equivalent to 16 eight oz glasses of cranberry juice cocktail). Water, Glycerin, Proprietary Blend (Cranberry Concentrate, Ascorbic Acid, D-Mannose, FOS, Bromelain). Contains 2 % or less: Sucralose, Acesulfame Potassium, Potassium Sorbate (to preserve flavor), Sodium Benzoate (to preserve flavor), Phosphoric Acid. My mom is in a nursing home and is prone to repeat UTI's. Repeat UTI's meant repeat antibiotics and C-Diff infections which then caused more UTI's - and the cycle continued. Mom's been on UTI-Stat for 3 years now and it's helped immensely. There are many factors which cause urinary infections, and all need to be addressed at the same time, but I would strongly suggest this product for anyone suffering from a bacterial based UTI. No bladder infection since I started using it. If this is the reason, I am very pleased. No bladder infection since my mom started using it in assisted living. I am very pleased with this product.